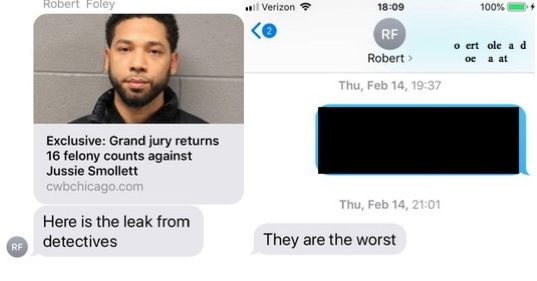 The Cook County state’s attorney’s office late Tuesday released hundreds of text messages and over 3,000 pages of often-duplicitous emails related to the Jussie Smollett hoax hate crime case. CWBChicago has summarized our review of the materials in Twitter threads here and here. Our reporting makes a number of appearances in the produced documents. In one exchange, top staffers in the prosecutor’s office appear—uh—disappointed to learn that CWBChicago found that every other person who faced the same charges as Smollett under Kim Foxx was forced to plead guilty to a felony before the state would agree to settlement terms. In another text thread, a top Foxx adviser called Chicago police detectives “the worst” as he wrongly blamed those investigators for the “leak” that led to CWBChicago’s breaking news that a grand jury had charged Smollett with sixteen felony counts. Another staffer calls CWB “the culprit” responsible for reporting the grand jury’s action. The truth is that CWBChicago’s reporting team discovered the story by doing what they do every day: They scoured active criminal and civil court files for developments of interest to the public—then, they told you about it.